For the CIAO 4.6.1 / CalDB 4.6.2 release notes see How CalDB 4.6.2 Affects Your Analysis. The periodic ACIS T_GAIN correction upgrade for Feb-Apr 2014 (Epoch 57) has been released. The corrections are at nominal/expected levels of less than 2% of the energy value. This upgrade as usual affects observation data taken over the two most recent T_GAIN Epochs (57 and 56), and so would update PHAs for OBS_IDs taken since 01 Nov 2013. Users with such datasets are encouraged to revalidate their analysis results after reprocessing their data with the upgraded CalDB files. For specific details of the new calibrations in this release, see the technical details section below. Because of increasing spacecraft temperatures, we have discovered a need for further time- dependent corrections of the ASPECT alignment coefficients stored in the PCAD CALALIGN files. The corrections being introduced in Sept 2012 and later observations are at the level of 0.2-0.4 arc seconds in all four instruments. There is an additional 0.2 arc second correction for HRC-S that has been found to exist since 2003 that is also being fixed in this release. In total, existing CALALIGN files in CalDB need to be upgraded (specifically for 2003-06-09 and 2006-12-10), and two more need to be added to the library (for 2012-09-13 and 2013-01-19). See the technical details section below for more information. DS ASPECT LEVEL 1 Pipeline. The PCAD align file upgrade cannot be applied in CIAO; Reprocessing of affected datasets will be required to implement the corrections for the archive. The timing of this reprocessing is currently being worked out within the CXC DS, and is expected to begin in August of 2014. The ACIS Calibration Team has determined that the rate of contamination on the Optical Blocking Filter has become enhanced to an apparently linear buildup of the carbon component since early-to-mid year 2013 (specifically the date 2013.3 for the new CONTAM model. To address this issue in the near term, they have produced a new ACIS CONTAM model file, which is now named version N0009 as above. As illustrated in the technical details section below, the new model provides much more reasonable best-fit parameters for standard calibration sources such as E0102-69.3 and Abell 1795 on both ACIS-I and ACIS-S. The ACIS time-dependent gain corrections (T_GAIN) have recently been updated for current changes from the previous T_GAIN epoch, specifically Epoch 57, which was February-Apr 2014. With the addition of these new corrections, derived from ACIS External Cal Source (ECS) data taken during radiation zone passes, the CalDB files extending from Nov 2013-Jan 2014 (i.e. Epoch 56) have been finalized, and new non-interpolating T_GAIN files are now implemented for Epoch 57. Long term trends for chips I3 and S3 are plotted below in Figure 4a and b, through Epoch 57, the latest release. The chip locations for these plots are given in the respective labels above the plots. Note that the locations are not the aimpoint positions, as with Figs. 1-3 above, but are near the centers of each chip. Since 2012, due to increasing spacecraft temperatures, the aspect camera thermo-electric cooler has been unable to maintain the CCD at a fixed -19C and the CCD temperature now fluctuates between -19C and -14C. The CCD temperature changes are coincident with shifts in the fiducial transfer system alignment that are visible in our X-ray/Optical/Radio cross-correlation monitoring. By calibrating against highly-accurate positions of optical and radio counterparts of X-ray sources, the ASPECT team has determined new alignment offsets that best reduce the mean offsets presently visible in their correlation data. 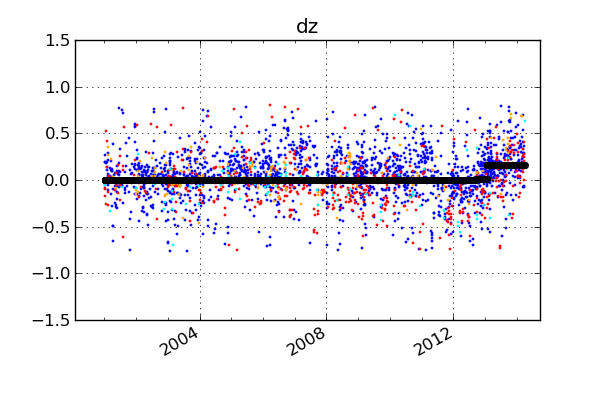 A global correction for a dy offset in all HRC-S data since 2003 was also noticed and applied (0.22 arcsec). We used Sherpa to fit a 2-step model to the available dy and offsets since 2012 (all data since 2001 included on the plots for reference). 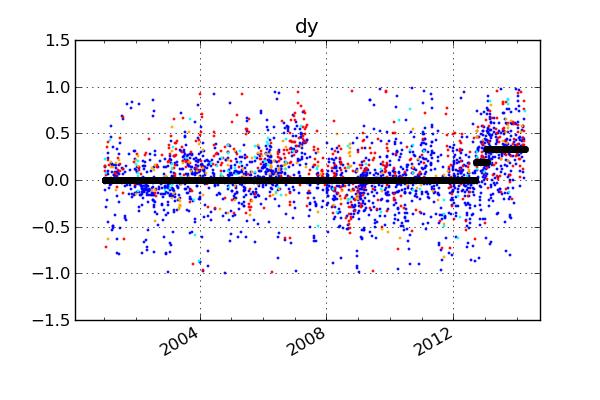 In the plots above the blue, red, cyan, orange points correspond to ACIS-S, ACIS-I, HRC-I, and HRC-S, respectively. The 2-step model fit both the natural break points in time for 2 new calibration intervals and fit the appropriate dy and dz offset values. These offsets are in addition to the offsets already present in the calibration file that was used to process the data in the last processing (pcadD2006-12-10alignN0008.fits). To create new CALALIGN files, first N0009 versions of the all files were made from the in-use N0008 files using the copy_existing.py script. Then, new CALALIGN files were created using the offsets determined above. The new offsets were applied to the pcadD2003-06-09alignN0008.fits file using time_align.pro. The 2003-06-09 file was used as a starting point to facilitate applying the aforementioned HRC-S offset. The ACIS Calibration Team has reviewed more recent observations and found that the Optical Blocking Filter (OBF) contaminant has been accumulating at newly more rapid rate than predicted by the current model in CalDB (version N0008, released in CalDB 4.5.9 in December 2013). See Fig. 6 below, in particular the last two triangular data points on the plot past year 2014. To address this issue in the near-term, H. Marshall of that team has provided an updated CONTAM model which accounts for the observed absorption increase much more accurately at least in the continuum regions (i.e., between the included elemental absorption edges of C, O, and F.) The Calibration Team has elected to release this new CONTAM model file immediately to address the enhanced absorption now occurring on the ACIS OBF. Fig. 6: The C-K component of the contaminant optical depth, including the 2014 data points. The last two triangles indicate an enhanced C-K build-up during the past year. The new model CONTAM N9981 (to be designated as CONTAM file version N0009 in CalDB 4.6.2) differs from N0008 only in that the optical depth of the first (Carbon) layer (which dominates) has an addition to the time dependence. 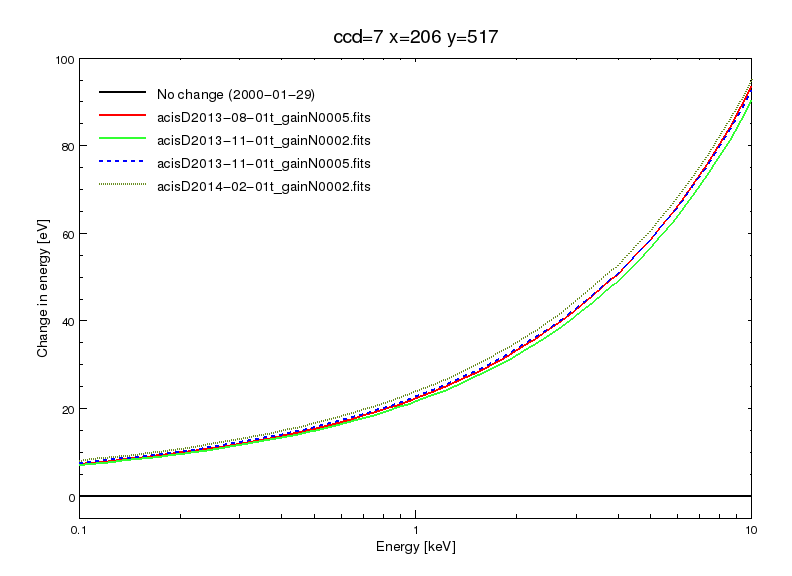 The addition is zero before 2013.3 and ramps up linearly to 0.75 optical depths at C-K by 2014.3. All other parts of the file are identical. Hence for observations taken before 2013.3, there is zero change from the N0008 file. For those after 2013.3, however, the N9981 file is found to fit the data considerably better, both on ACIS-S and ACIS-I. To illustrate the improved fits, see Figures 7-9 below, wherein best-fit parameters using the N0008 and N9981 (N0009) CONTAM models of galaxy cluster Abell 1795 and SNR E0102-69.3 are compared. 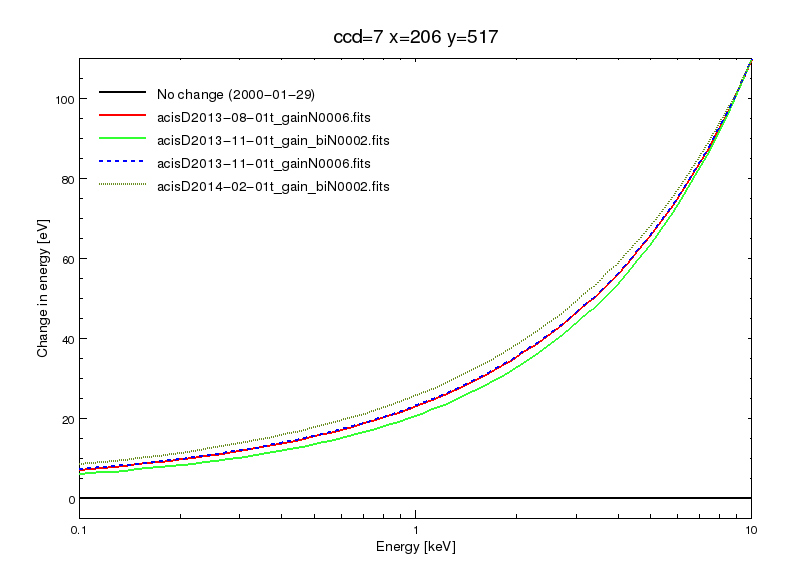 For figures 7 and 8, fluxes from A1795 versus time indicate that for 2014, there is a significant decline in the fitted flux using the CalDB N0008 CONTAM file model, and this result is not realistic. However, with the new N9981 (N0009) model, the measured fluxes are identical before 2014 with N0008, but after 2014, the new model gives a much more realistic result. Hence N9981 is better for more recent A1795 observations on ACIS-I and ACIS-S. Fig. 7: Fluxes derived from the standard IACHECK annular region of A1795 on ACIS-I taken at various dates over the life of the mission. The fits were done with CONTAM N0008 ("CALDB") and N9981 (red). Considering Figure 9, now, the E0102 normalization shows a significant change for the CONTAM N0008 in CalDB for the most recent observation, namely OBS_ID 16589 (i.e., the last red data point in the graph). 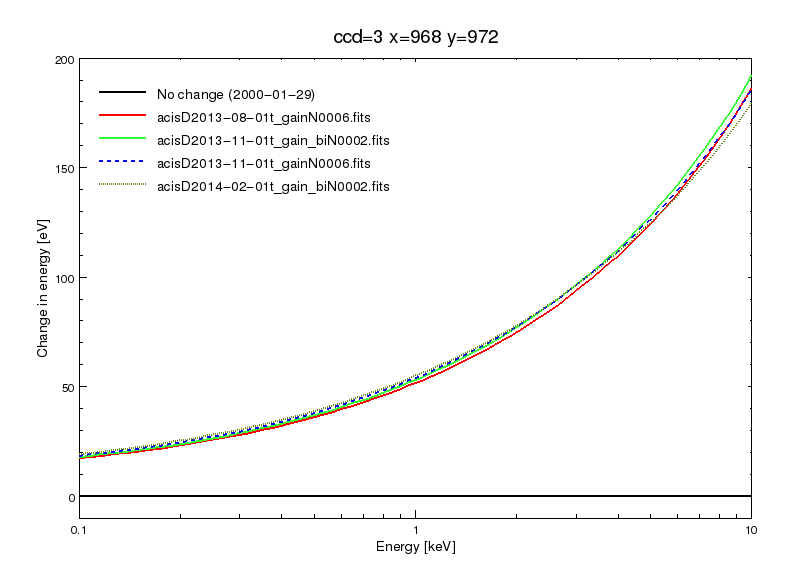 However, with the new N9981 model, the normalization is commensurate with earlier results (the last black data point). Fig. 9: Best-fit overall normalizations for the standard IACHECK region of E0102-69.3 at various dates over the life of the mission. The black data point past 2014 (for OBS_ID 16589) is the normalization from a fit with the N0009 (test version N9981) CONTAM file.